Carl Santos Construction are experts in building storage barns and other structures of all sizes, with designs customized for any need. A spacious storage barn can be built to your specifications to give your personal or business dreams room to grow. Protect your autos, RVs, boats, and animals, or provide a central place of operation for your business and storage for your business inventory. 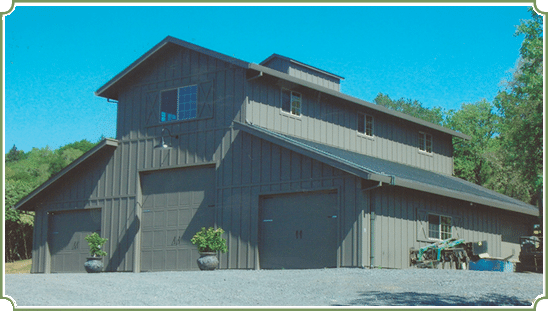 Your custom barn design should be created according to what you are storing, or what special use you have for the space to make its function match your needs. This is why even a high end prefab kit isn’t likely to be optimal. In addition to creating a custom designed space, a barn created by Carl Santos Construction will often be more affordable. Call Carl for a consultation on your storage or special purpose barn project. Neat & Respectful The barn turned out exactly how we wanted! Carl and his workers were right on the project rain or shine. They were neat and respectful of our property. We would highly recommend him. Copyright ©2014- Carl Santos Construction. Our service area includes North San Francisco Bay Area counties surrounding our home base in Sebastopol, CA.